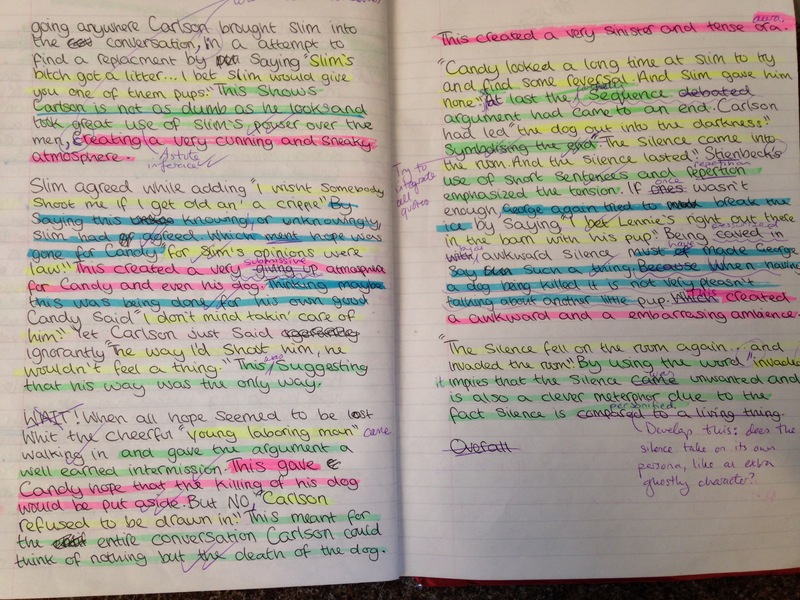 Using a colour coding system to help students structure their paragraphs in their literature and language essays, or in any other subject (this is not using RAG to grade the strength of an aspect of their answer). Not ground-breaking, but – hopefully – quite useful. Most English teachers, along with some other subject areas, will be very familiar with the PEE (point, evidence, explain) structure we encourage students to follow, whether they are analysing, explaining, or even describing (depending on what those skills ‘look like’ in any given field and respective exam answers). When I was at school, I was told to use PQA: make a point, back it up with a quote and then analyse it. However, although variations of this method are still useful and applicable (and, let’s face it, it’s easy to remind our students to ‘pee’ all over their work, even though this joke still isn’t funny, no matter how many times we roll it out to our year 10s), I have always found that half the class still find it arbitrary to use, like it’s something too vague to apply to the things they want to be able to say. Often they want to make a strong statement about something the writer has done, for example, but they’re not sure whether this is the ‘point’ or the ‘explanation’ as, particularly with a cognitively demanding skill such as analysis, it can sometimes be difficult to separate the description/point from the effect (e.g. Steinbeck uses eye dialect to convey the educational backgrounds of the characters). If we are brutally honest, structuring this thought process comprises a wider skill set that merely PEE. In my opinion, logically sequencing, linking and developing a thread of a point, argument or any exam answer, in an extended prose format, is as much about their literacy skills as it is about their understanding of the topic in hand. We expect them to be able to signpost their discussion using connectives and discourse markers, yet PEE only offers a rudimentary format for this. In reality, we may need our A and B graders to use P/Ev/Ex/Ev/Ex/P! I wanted to scaffold their writing even more so, without falling into the trap of issuing repetitive sentence starters that, ultimately, often result in robotic and contrived writing styles and quotes not being integrated smoothly. I pulled apart the mark scheme criteria and considered what the examiners actually wanted them to talk about. I have since created different versions to reflect different essays/controlled assessments/exam spec requirements, but have tried to keep some common skills the same colour throughout the course. I now use the colour coding system when making them self/peer assess, or when making them identify ingredients in good/poor essay exemplars (they enjoy highlighting it), or even to speed up my own marking (so I just highlight and spend less time annotating). I told the students that the colours (i.e. the skills) could come in any order and we often discussed which colour we should see more of. We could then talk about the way quotes should be short, and integrated, so any splashes of yellow should not be very large, but they should be frequently dotted around their essays. 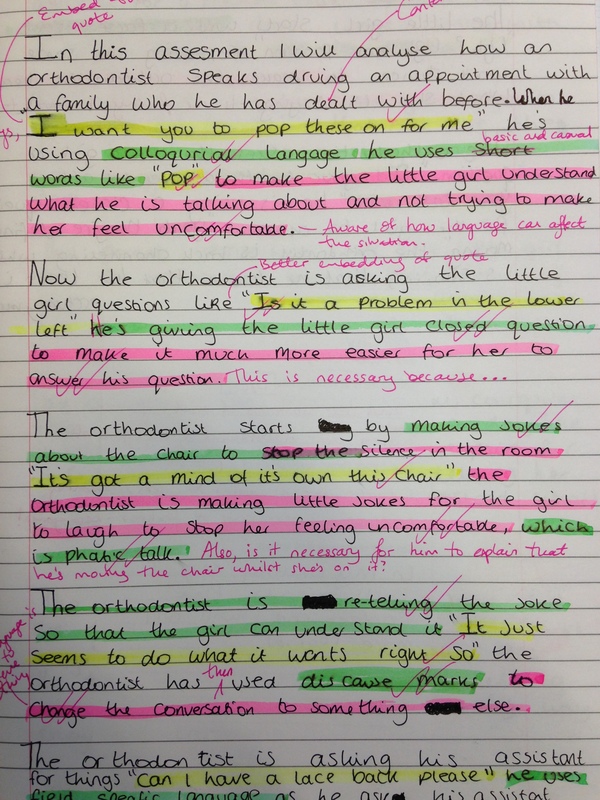 Some of my students started to use two colours, where their analysis actually fell into two categories, using the main colour to highlight, with the secondary colour to underline that same passage/sentence. I moved on to having a colour just for connectives and discourse markers too, so that they could learn how to link and develop ideas. Speaking with other subject areas, it’s clear that many exam boards expect students’ answers to contain specific things and even in a particular order/format. Humanities teachers at City Academy make this very explicit, so when students, say, see an ‘explain’ question, they know how to structure their responses, and that they are to include two examples. Having a colour coding system for the components of extended answers makes the teacher have to really learn the criteria, and helps students to organise their ideas and identify what’s missing from their answers. Highlighters: I went to Poundland, bought 15 packs of highlighters, and gave each student their own personal set, with their name on a sticky label. Although I’m not advocating we splash our own cash on resources, having personalised packs has made my year 10s take better care of the pens! I would also advise having the colour code key on a PP slide, or printed out and glued into their books. Provide a good exemplar paragraph of whatever it is you want them to produce and have it highlighted with the colours so that they can see what each skill/ingredient looks like. All of my classes love it. They find it easy to see what skill is missing from their writing, because they can see a lack of yellow/pink etc. and can then articulate what it is they have to change or add. It’s really worked well with the boys who seem to prefer a more visual representation of things – something that can be hard to do in English when teaching extended writing. They always ask me to use it when marking their essays too, and it’s become easy for me to write “more yellow” on the EBI section of our marking stickers, for example. It has also meant that we can finally move away from PEE in its original, rigid and prescriptive form, as the components can be used in any sequence, especially at the higher end. Obviously, unlike RAG, it doesn’t colour code the quality per se. However, I have found that my less confident students prefer this method, as they don’t then have to be disheartened by the colour pink denoting that their three-sentence ‘explanation’ is only an E grade. I can address this instead in my annotations and formative marking. It forced me to learn the assessment criteria really well, which then impacted on the way I wrote learning objectives, outcomes and success criteria. I would advise all subject areas to really consider how students should be structuring their extended prose exam answers or coursework, and if they aren’t quite sure, then this is a gap that needs addressing, both for the teacher and the students. Finally, it also saves a lot of time in the long run; you don’t always have to provide sentence starters or phrase banks for each piece of writing because students will, over time, be working according to a familiar set of success criteria that they end up developing their own idiosyncratic ways of phrasing and introducing, once they’ve seen a few models. It’s a great way to support a tricky aspect of literacy.